A lot of people prefer to toilet train in the summer, rather than winter, as they have more time available, the weather is warm and they can let their child run around in the yard diaper free. Some people even train two children born close together at the same time to take advantage of the long summer days and warmer weather. Other people feel it's easier and less stressful for them to train one child at a time. You could still train two children born a year apart in one summer, if you train one at the beginning of the good weather and one towards the end. This is especially true if you have an older boy and a younger girl. Research shows that girls are consistently ready earlier than boys, and almost all children are ready by 2 ½. In fact in 1960, 90% of American children were trained by the age of 2 ½. However, this number declined to only 22% by 1997. What happened? Since the almost universal adoption of disposables, which make children less aware of their elimination processes, training has been happening later and later. Some children are even not potty-trained when they are ready for school, unheard of a generation ago. In other cultures, training may take place very early indeed. A 1977 study of the East African Digo people showed that they believed in starting training in the first weeks of life. Using a nurturing conditioning approach the Digo people achieve day and night dryness by the age of 5 or 6 months! Even in America, a government paper, Infant Care, published in 1932, recommended training by 6 -8 months of age. Not only are there world wide cultural differences as to the age to start potty training, there are differences of opinion within the United States. African-American parents begin training around 21 months and most expect their child to be completely trained by 2 ½, a good 6 months or so earlier than Caucasian parents. Caucasian babies, on the other hand, usually don't start toilet training until 30 months and may only be trained by the age of 39 months or even later. Beginning toilet training late, meaning over the age of 3 ½, seems to lead to more problems in certain children, such as increased constipation and stool toilet refusal, and hiding during training. Also, there is more likelihood of infections and cross contamination in childcare facilities if the children are not trained until later. The American Academy of Family Physicians and the American Academy of Pediatrics current guidelines suggest that you should begin training when your child shows signs of readiness, around the age of 2. Remember you have to be ready and have the necessary time as well! 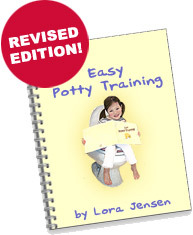 If you read our site and follow our Easy Potty Training Guide, your toddler will soon be potty trained and messy diapers will be a distant memory.